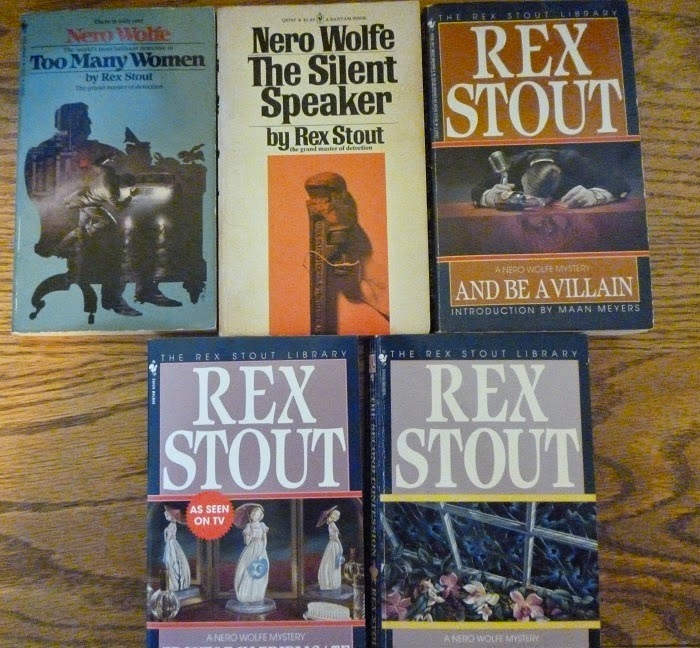 This is the third installment of the Nero Wolfe Project, reviewing each of the books as they were published. This time, we're going to look at The Silent Speaker, Too Many Women, And Be A Villain, Trouble in Triplicate, and The Second Confession. By this point in the series, Stout has everything down to a reasonable formula. Not that the series is formulaic--far from it--but the characters have all established their traits, the reputations of all the major and minor characters are set, and readers more or less know what to expect. The Silent Speaker: When a representative from the government is killed right before a major speech to a hostile, industrial association, it's up to Wolfe to find out who the murderer is. The search for a missing dictaphone cylinder which likely holds the key evidence starts a race between Wolfe and the police. An average mystery is made exceptional with the injection of a few points: the "race" to find the evidence is a nice deviation from previous books, the dismissal of Inspector Cramer (and Wolfe's genuinely compassionate opposition to this action) and Wolfe's politics inject some needed amusement, especially after the fact. Too Many Women: Wolfe and Archie are starting to get on each other's nerves. A large company had one of its employees killed by an accident; but in the course of filing the paperwork, a manager declares it an "unresolved murder" instead Internal strife (and huge egos with lots of money) lead one of the managers to hire Wolfe to get to the bottom of it; as a result, it gives Archie a good opportunity to be "hired" by the company undercover (and away from Wolfe for a while). When the manager who initially approached them is killed in the same manner as the original victim, it's clear that it was murder...and Wolfe tries to see it to the end. Again, this breaks from the formula in a refreshing way--we, through Archie, get away from the brownstone for a while. Most of the tactics rely on injecting false gossip into the steno pool (the "Too Many Women" of the title) and watching the dominoes play out. (To be fair to Stout, the men are seen as just as much gossips as the women; it's just the concentration of them in the steno pool that enhances it.) It also solidifies Archie's luck with the ladeeeeez...and the tacit acceptance of those skills by Wolfe in pursuit of the investigation. And Be A Villain: When the guest on a popular radio show is killed on air from drinking the sponsor's product, the hosts, producers, and sponsors of the show approach Wolfe to find out who did it...since the police haven't figured it out and Wolfe can be discreet (and, incidentally, protect the sponsor's name). Just gathering all of the suspects is a trial in and of itself--one, a minor, ran away with her mother to get away from the publicity and required trickery to bring back--but when the attention focuses on the victim himself, things get much more interesting than lousy-flavored soda. This is the first book in what is known as the "Zeck Trilogy," one of the few multi-book plot lines in the entire series. To be fair, this merely introduces Zeck as a character--a shady criminal overlord who warns Wolfe not to dig too deep. While it's not a major plot point, it's clear that it's set up for future stories. Otherwise, this is a good mystery with a lot of bright, engaging characters. Trouble In Triplicate:This book has three short stories: Before I Die, Help Wanted, Male and Instead of Evidence. In Before I Die, a notorious gangster approaches Wolfe with an unusual problem: he has a daughter who doesn't know who he is, and her existence was found out by rival gangsters. So to divert their attention, he hired someone to pretend to be his daughter, who was starting to extort him for the work. Normally Wolfe wouldn't take the case from such a high-profile criminal, but there is a meat shortage and the allure of black-market meat makes him take the case. In Help Wanted, Male, a client who receives a death threat turns to Wolfe for protection; advising he doesn't really do that sort of work, declines. Of course, he ends up murdered--and since Wolfe had previously done work for him in the past, the investigation involves Wolfe. Wolfe then receives a similar death threat, and undertakes a body double to suss out the murder. Instead of Evidence: A client, a wealthy novelty manufacturer who believes he is going to be murdered by his partner, comes to Wolfe, pre-paying the investigation into his murder. When he, of course, ends up dead, Wolfe had to take on the case posthumously. Before I Die is an interesting mystery, but both Help Wanted, Male and Instead of Evidence capitalize off of the formula of the series. Both are hilarious in parts--watching an imposter have to act like Wolfe in character is something to behold, and the novelty-maker who attempts to sway Wolfe with the ridiculous notion of a talking flower ("Orchids to you!") which prompts him to leave his own office in disgust--show humorous writing that loyal readers can truly appreciate. This is one of the best novels yet; even though the secondary story of Zeck is fascinating in and of itself, the main mystery is full of interesting characters, innovative plot points, solid action scenes, and some grand characterization. Of these five books, none of them are bad--in fact, this is where everything just sort of comes together. We now know all the characters, so when they are out of their comfort zone it's all the more enjoyable. Stout has also improved his humor and writing skills; the mysteries themselves are plotted well, and nearly all of these are at least somewhat believable.